The market volatility continued this week and it was best demonstrated by the Shanghai Composite Index, the stock market index of all stocks traded at the Shanghai Sock Exchange. In 2014, Shanghai Composite was the best index returning +52.9%. During the last 90 days of the year, it was up almost +40%. By the end of second week of the year (January 16), it was up another +4.4%. Then on Monday, January 19th, it dropped like a rock for -7.7%, the catalyst being the Chinese government’s crackdown on speculation. By the end of the week, however, it had recovered almost all of that. The two-week 30-minute chart of Shanghai Composite shows the volatility. On Monday the index gapped down and then after making a minor ‘double-bottom (non-exact) on Tuesday, it continued to climb up before retreating mildly on Friday at the January-high resistance level. The basic chart-pattern of the S&P 500, in 30-minute timeframe is similar though it did not occur on the same dates, After making the high for the year on January 9th, it retraced and the made a double bottom on Friday, January 16th. Last week it just kept on climbing up before hitting the resistance at the year’s high. 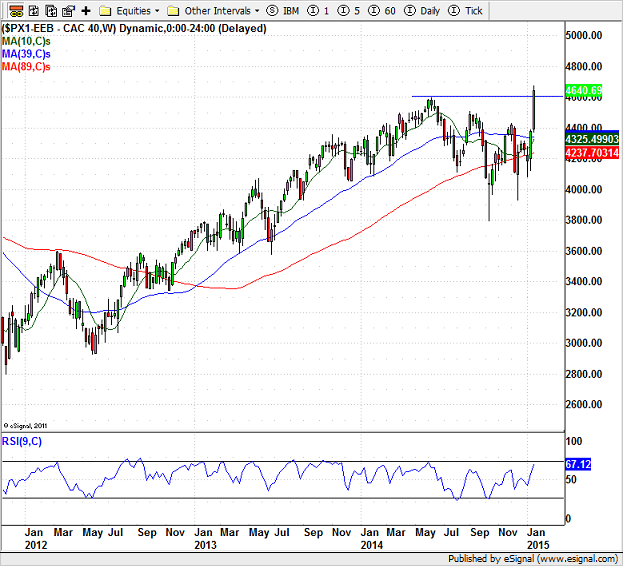 The daily chart of S&P 500 shows the volatile trading range since December 8th more clearly. Since then the index has had six short & sharp moves either up or down; each move lasting 3-8 trading days. The tug-of-war between the bulls and the bears hasn’t resulted in a clear-cut winner so far but is also apparent that the bulls are not yet ready to forfeit the upper hand that they have enjoyed for a long time. Buying the dip mentality is still alive. However, the simple technical analysis tells us that it is not all clear sign for the uptrend. 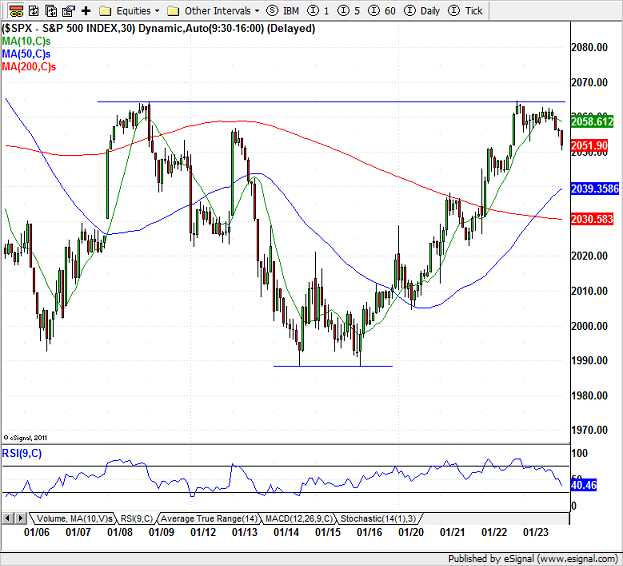 All major indices still have some immediate resistance levels to overcome and are traversing similar looking patterns. Depending upon one’s market bias one can view these patterns as bullish or bearish. Another alternative is to wait for the pattern to complete. 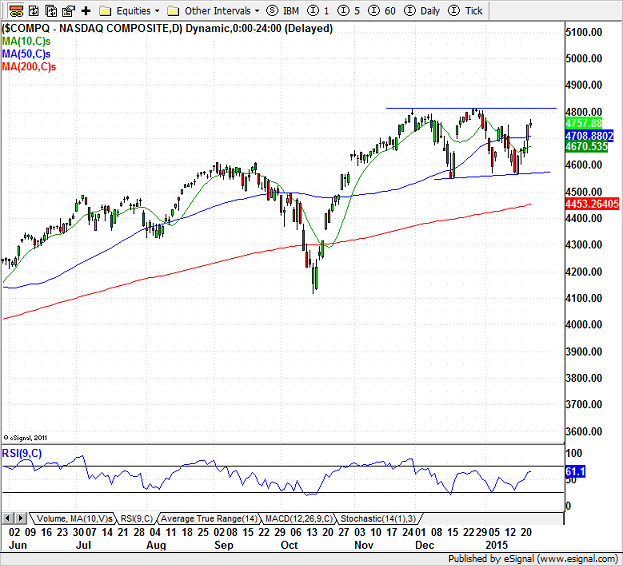 In the accompanying daily chart of S&P 500 we can see two such emerging patterns. One is the upward sloping rising wedge and the other is Head-&-Shoulder patter, albeit an uneven one. 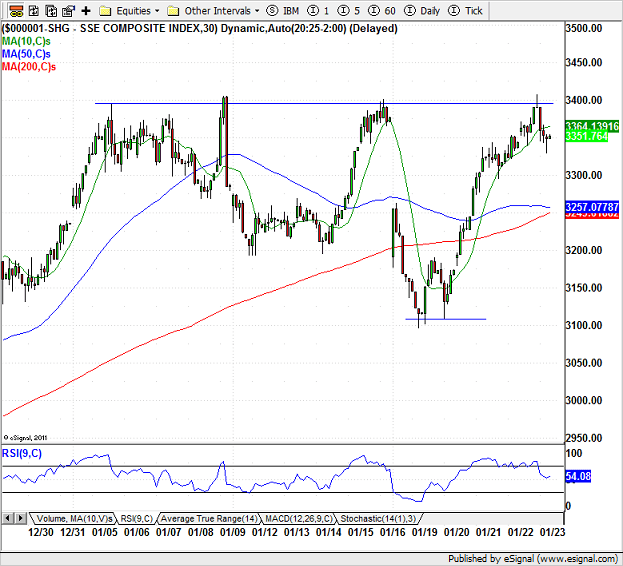 A break above December high of 2093.55 will nullify the H&S pattern and will be bullish, whereas, a break below the January low of 1988.12 will complete the pattern and will be bearish. Note the uneven Right Shoulder of the pattern. For the rising wedge to complete, the index has to break below the upward sloping bottom line convincingly. The rising wedges have a bearish bias. However, it does not indicate how much the price will fall. Going by the past few year’s history, S&P 500 will have some strong support levels to break even after the rising wedge pattern completes. The chart pattern of NASDAQ composite and Dow Jones Industrial Average are also similar, though not exact. 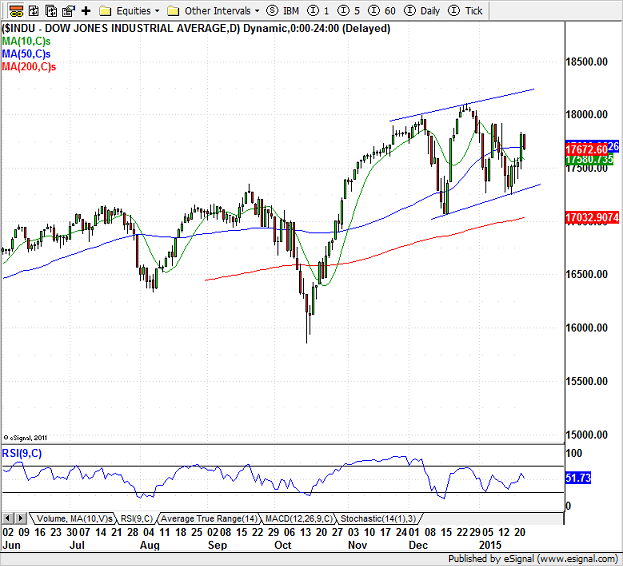 Dow’s pattern looks more like an upward sloping channel, which indicates continuation, than a rising wedge. NASDAQ’s pattern is more like a horizontal channel, hinting trading range, than a rising wedge. From the perspective of the Dow Theory, a confirmation has to occur to indicate the resumption of the uptrend or the down-trend to begin. In late December, the Industrials made a new high but the Transports did not. 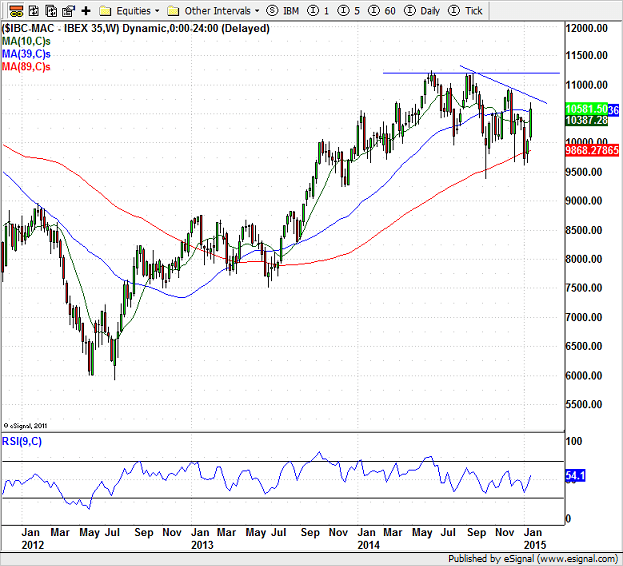 For the uptrend to resume convincingly, the Transport have to rise above the November high of 9310.22. On the other hand, neither of the indices have broken below the December lows, hence there is no indication of a break in the uptrend. The bottom line is that the current market outlook remains bullish. 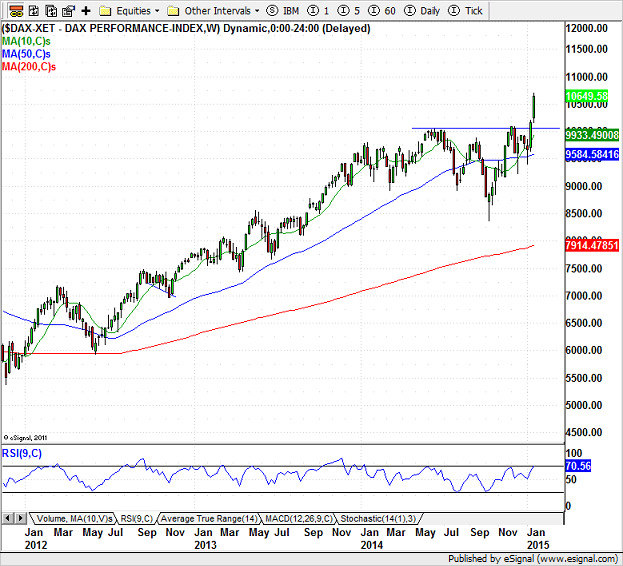 Major European indexes are in different stages but they all are breaking out. 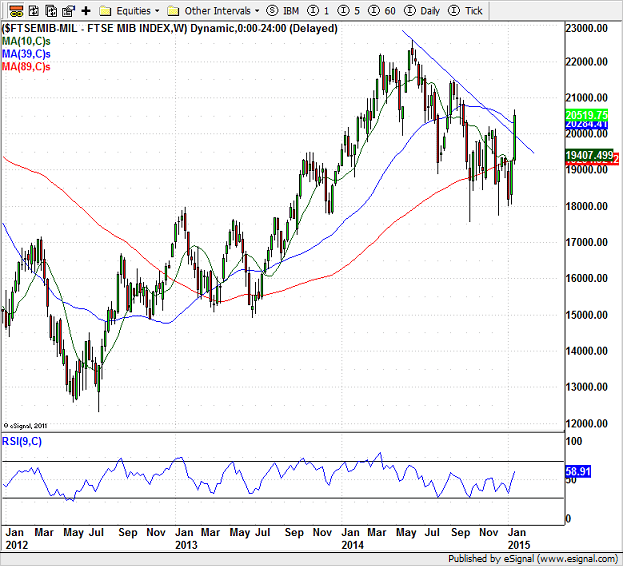 STOXX 600 and Germany’s DAX have broken above the all time high; French CACI-40 is at the highest level since June 2008; Italy’s FTSE MIB has broken a down-trend line and is forming a bull-flag; Spanish IBEX 35 is lagging but is threatening to break above the down-trend line and form a bull-flag. Here are the weekly charts. For 3-month and 12-month periods most global indices have been showing a sharp rise except for the troubled spots like Russia because of Ukraine and sanctions; Switzerland because of the euro peg removal and Brazil. Commodities are still having a rough time. Except for precious metals all declined for the week. Most commodities are down for the last 3-month and 12-month period too. The world does seem to have deflationary concerns. The ECB move and continuing good economic news from the Unites States are keeping the greenback strong. 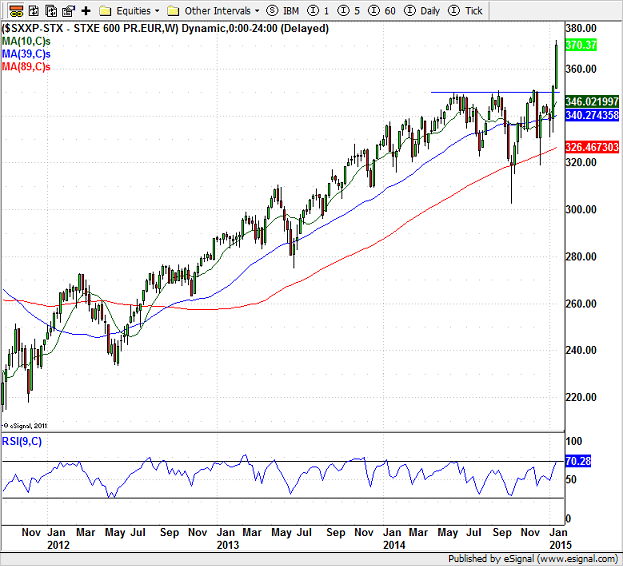 January 25, 2015 in Market Commentary.